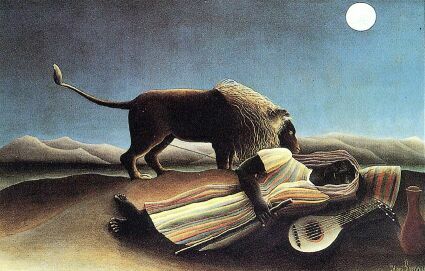 During the sleep cycle, often after a brief or long period of insomnia, a sleeper may experience the sensation of leaving the physical body and traveling in a second body, sometimes in what would seem to be the physical environment, sometimes through distant, perhaps even wondrous realms. Is this experience a dream or literal reality? Although many choose to regard this experience in the most literal manner, Stephen LaBerge has recorded many such in his sleep lab and has determined that these nocturnal or napping experiences occur during REM (active, dream) sleep. For this reason and for others, I would consider it preferable to regard these experiences as dreams, dreams in which the dreamer is already partway "awake" and from which s/he can easily become lucid. In one type of OBE, the dreamer is abruptly propelled "out of the body" and into vibrant or empty space, sometimes accompanied by other beings. The dreamer may enter realms of unusual beauty or of exquisite terror. Because of the lack of control, the dreamer may consider the experience to be of supernatural origin. I see no reason to jump to this conclusion. The bodily sensations probably have a physical origin, and the imagination of the dreamer most likely supplies the imagery. Yet even with an implied natural origin, the imagery of these dreams can be highly meaningful to the dreamer. Moreover, in such an unusual situation, the dreamer will feel more secure if s/he becomes lucid and considers, "I'm dreaming. I don't need to worry that I won't get back to my body. I'll simply wake up when the REM period is over." In other OBE-type dreams, there seems to be far more control. In them, dreamers seem to leave their bodies and wander or even fly about in their own natural locale. They often assume that they are in an "astral" body within physical reality. Yet, in most cases that "physical reality" will soon subtly or significantly diverge from the most literal representation of the locale. Consider, surely we know our own home, our immediate neighborhood well and can easily form a mental image of it. As much as it seems we are in our physical bedroom in some kind of astral double, it is likely that we are, in truth, in a mental replica of our bedroom in a mental image of our body. The same experience of being in our own locale in a nonphysical body occurs in other types of lucid dreams. I have had the exact same experience through Stephen LaBerge's "One Body Technique." In it, one does not leave the body at all but waits for the sleeping body to turn into a mental image of itself. False awakenings into a replica of one's current bedroom can also give the same effect, if one becomes lucid during the false awakening. The simplest way to produce the exact same feel is to be lying in bed one moment falling asleep and, in the next, to be standing in the middle of one's bedroom -- the middle of the mental replica of the bedroom in a mental replica of one's body. To prove one is dreaming, the dreamer can lift off into the air, try to read print, or check a digital clock. By whichever of these four methods one visits the mental image of one's locale, I believe such experiences are far more enjoyable when the dreamer becomes lucid and does not confuse the physical with the mental. So-called astral travel then is travel within the dreamer's mind. When the dreamer becomes lucid, the dreamer can explore, the dreamer can enjoy, the dreamer can learn about his or her mind, its contents and how it works. This article originally appeared in The Dream Explorer in 1991.